Time to Replace Your Larson Boat Canvas? Larsonâ€™s story is one of innovation, quality and a commitment to a better experience on the water. For well over a decade, Ameritex has provided canvas tops and covers for Larson that are perfectly aligned with those ideals. 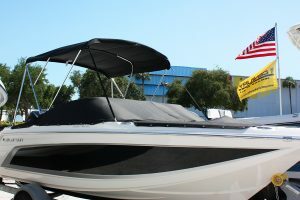 We have worked closely with Larsonâ€™s engineering team to develop the best fitting and functioning boat tops and enclosures, made from the highest quality materials, and designed specifically for your boat model. In other words, the Larson canvas parts that youâ€™ll find on this website are the exact same ones that were placed on your boat before Larson shipped it out to you. Over time, due to exposure to sun, wind and rain, your boatâ€™s canvas is destined to deteriorate. Ameritex can help you replace that worn out top or cover with brand new, identical canvas parts. And rest assured, those new pieces of canvas will protect your Larson better than any aftermarket product out there. It will have the same fit, finish, and quality that made you buy a Larson boat in the first place. Thatâ€™s because Ameritex made the canvas for Larson then, and we will remake it for you now. You care a lot about your boat. It’s an investment. Find out just how easy it is to restore the worn canvas on your Larson to brand new. Submit a no-obligation quote request now.